Close to seven and a half years after six people died and dozens more were injured in a coach crash at Joe’s River, St Joseph, insurance claims are still being paid out. An official within the general insurance sector told Barbados TODAY that more than $17 million had so far been paid out to the families of the victims, including those still being treated for lingering injuries. “Seventeen million dollars have so far been paid out and it will be more than that because people are still being treated [for injuries sustained during the incident],” the official pointed out. Families who were affected by the tragedy are still trying to come to grips with the loss of their loved ones as the memories of that fateful morning remains alive. While all of the families could not be reached for comment, those contacted today found difficulty in expressing their feelings at this time. 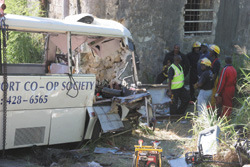 It was just after 11 a.m. on Sunday, July 29, 2007 that three men and three women travelling in a Barbados Transport Cooperative Society coach met their death, when the vehicle ran off the road and slammed into a wall. A flashback to the accident scene of July 29, 2007. The 40 seater was carrying people who had bought an all-inclusive package from Mount Gay Distilleries to attend the National Cultural Foundation-produced Party Monarch Finals on the East Coast. Apart from the six dead, 37 other passengers travelling in the vehicle had to seek medical attention at the Accident and Emergency Department of the Queen Elizabeth Hospital. Those who perished in the disaster were Adrian Franklin, Lorrie Marshall, Nancy Griffith, Kenrick Harewood, Morton Brathwaite and Deborah Murrary. The General Insurance Association of Barbados (GIAB) recently expressed concern about the level of claims being paid out annually. Statistics from the GIAB made available to Barbados TODAY, revealed that about $1 billion in motor and property claims had been disbursed in the last three years. “An average of $300 million per year in claims are being paid out. That is very high for a small country like Barbados,” a GAIB spokesperson added. Meanwhile, with motor claim payouts passing the $1 billion mark, the majority of them for accidents in which drivers were distracted, the association representing insurance companies is calling for legislation to be urgently implemented to ban the use of mobile phones while driving. Of particular worry to officials of GIAB is that 65 per cent of these accident claims represented persons who were distracted while driving. One major issue, the road worthiness of the vehicles, bad brakes, bald tyres, bad night lighting, bad driving, illegal drivers, but saying this, what is being done by law enforcement. We always would hear excuses by the authorities, when ask questions as to what is being done to halt the said people in Barbados who are drivers and families to hold they bellies and screem when they love one ,fathers ,husbands , brothers , sisters becomes fatallities in accidents. Passing laws by politicians always they claim takes time, but when it comes to increasing they pay packets, that becomes so easy. We would always suffer this fate, if nothing is put in place, because ,certain efforts are for some people and not in the interest of the people. Dont all cars have to be road worthy already? Should gov make it mandatory for ALL vehicles to hv six month inspections? 2. Your are correct about a cellular phone ban. It needs passing aswell as breatherlizer tests needs instituting. 3. Paying out all that money while still making a profit, I suspect is not a bad business. Yall are mandatory by gov,,make the rules work in your favour,,and then administer the payout,,albeit with lawyer friends ofcourse. Stop crying and do good with the spoils and enjoy the rest, if all these things were such a big issue for yall bottom line I know yall would get politicians act on yall behalf,,yall pockets very very deep.